Please feel free to offer your condolences to Ivan’s family using the form below. Your entry will be displayed in our book of condolences on this page. E-mail address will not be displayed. I am a Poole Pirates fan from the 50's and 60's mainly but that did not stop me buying his book "the will to win." I feel I want to apologise to you for the way Ivan was treated at Poole when riding for Newcastle in about 1964. As he came out of the changing rooms and walked across the old football pitch on his way to the pits he was booed all the way by the home fans. Not because he was a dirty rider but that the home fans knew their best riders/ heroes were about to be beaten by him. I was amazed to watch him lay the bike [JAP] down as he crossed the start/finish line, never seen that before! I would say a lot of the home team fans did not enjoy seeing their stars beaten by Ivan but he was probably used to it. To see the passing of a wonderful rider like Ivan is always sad but apart from his record championships what I remember about him is his incredible commitment to come to Europe as a teenager with his young bride and although that first trip didn't quite work out he never gave up and eventually returned and the world saw what a great champion he was. We will probably never see his like again. Thanks for the memories (Legend) R.I.P. Ivan. I last met Ivan about 11 years ago,he was running a school for young riders at Newport Speedway in Wales. He took time time out to have a chat and take some photographs with me. What can you say about Ivan that hasn't already been said, I'm 74 so I watched him ride all my life. RIP Mr.Speedway. Sincere condolences to the family. Had the privilege of watching him ride,many times. He was incredible. Did not always support him, but he was exceptional,in every way Had the pleasure and privilege of meeting him twice. Once at the Speedway Museum and once at Mildenhall, where I had the privilege of buying him and his wife,Raye, a drink . It was clear that he was unwell,but I did not know the cause. I told them both, the above. He smiled and shook my hand . He was a gentleman and the very definition of a great sportsman. God bless him. I first saw Ivan ride when he joined the Newcastle Diamonds in the early 1960's, and became a big fan of his from the start. I met Ivan on numerous occasions while asking for his autograph, and he signed everything I asked. 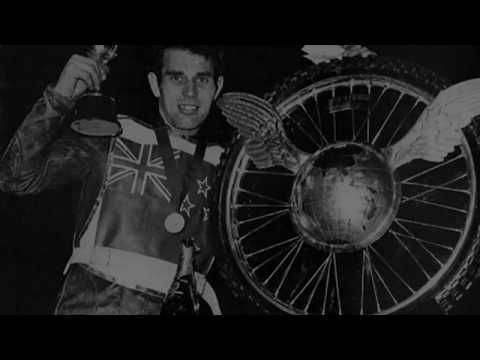 The highlight was when Ivan became the first, and still the only, Newcastle rider to win the World Final in 1968. Best moment was when I plucked up the courage to ask if I could shake his hand, and he said of course you can! Ivan Mauger, simply the best, better than all the rest (in my opinion). As a speedway journalist I interviewed Ivan many times and wrote thousands of words about him. Only three are necessary at this sad time. Simply the best. I am very lucky to have watched a lot of speedway in the 70’s when there were so many top riders and Ivan Mauger was right up there at the top. When it came to professionalism Ivan just took it to another level and six world titles speak for themselves. My sincere condolences to Ivan’s family. R.I.P. Ivan and thank you for the great memories. The supreme perfectionist and professional and a beacon for those who rode with him and followed him. It was a treasured privilege and a pleasure to have known Ivan. Condolences to Raye and the family. Rest peacefully Ivan - you deserve it. Sad news about the greatest Speedway rider of all time. He was my hero in my teenage years as I fell in love with motorbikes. Never forget seeing him as a guest at Reading Stadium with a handicap of 40 yards and winning by 40 yards. His cornering that day was legend - broadsiding with both feet on the legs! All young riders should watch film of him and learn from the best. Condolences to Raye and family. We have all lost a true great! So Sorry to hear that Ivan had passed away. So many memories, watching him in League matches, individual meetings such as Internationale at Wimbledon, Blue Riband at Poole, World Finals at Wembley, Intercontinental at White City. Especially remember meeting at Poole when we were struggling to get child and pushchair through gate. Up comes Ivan, grabs hold and lifts child and pushchair through! Bless you. No more chats and handshakes at Cardiff, wish now I had recognised signs when he and Raye were last at Wolverhampton, so obvious looking back. Rest in peace Ivan, you gave the speedway supporters of the world so much. A true gent. Prayers are with Raye and his children and grandchildren. Simply the Greatest! Thanks Ivan for all the great memories. A great competitor and Ambassador.